The most productive password recovery method (or PIN recovery like in our case) - is dictionary based attacks, where the software takes one word or phrase at a time from a dictionary and checks whether it works out or not. Optionally, you can enable mutation for each word. When it's enabled, depending on the depth of the mutation, the original word will undergo different modifications. For example, those can be adding numbers to the end of each word, removing vowels from it, etc. If you know a part of the PIN, you should take a closer look at the mask and base-word attacks and maybe even start the recovery with them. Artificial Intelligence Attack is a new type of attack based upon a social engineering method and allows, without resort to time-consuming and costly computations, to almost instantly recover certain passwords. 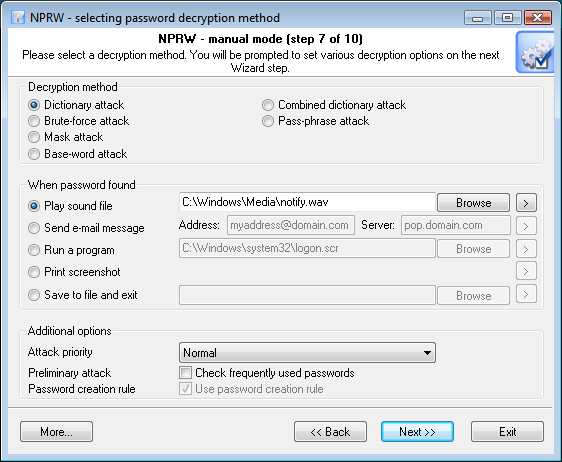 Dictionary attack - is the most efficient recovery method for simple passwords, when the program tries each word from the dictionary (or dictionaries if there are several dictionaries) you specify until it finds the original password or until the wordlist is out of words. This method is efficient since many people use regular words or simple variations for a password. Moreover, this type of recovery is performed quite fast compared to a brute-force attack, for instance. An additional set of dictionaries can be found there. Brute-force attack. If the dictionary attack has failed, you may need to take a closer look at the brute-force attack, when the program uses all possible combinations from the specified range of characters. For example, for a three-character range of lower-case Latin characters, it will check all possible combinations, starting with 'aaa', 'aab', 'aac', and all the way through 'zzz'. Actually, this attack is the slowest, so it is really great for short passwords. Mask attack. This type of attacks is useful if you have at least some information about the password. For example, you may know that the first four characters in the passwords are Latin letters; they are followed by a three-digit number. The mask attack is a variation of the brute-force attack, except that some characters for finding the password remain unchanged, and only a portion of the password may change. The special syntax is used for setting a mask or rule for finding a password. It will be described in detail in the corresponding chapter below. Base-word attack (developed by Passcape). At the first glance, this type of attack reminds the one we just described. It is just as efficient if a portion of the password to be recovered is known to us. However, unlike in the previous one, here you don't have to set a mask - just provide a basic word. The program will take care of the rest. The phrase attack is based upon the experience of the social engineering and uses over 150 rules for possible modifications of the original phrase to generate a great number of possible password combinations. Combined dictionary attack (developed by Passcape) uses primarily to guess compound passwords. It is very similar to the dictionary attack, except that instead of using a single word for password verification it uses a combination of words created from several dictionaries. The idea of the phrase attack (developed by Passcape) is to find the right password by searching through predefined and frequently used expressions, sayings, phrases and word combinations. This group allows setting an action to be performed automatically when the password is found. This option is convenient, for instance, to system administrators when passwords are being recovered on several computers at once. The program offers five possible notifications: play sound, send e-mail, run application, print screen or store results to file and close the program. Attack priority. If you are planning on using your computer actively during an attack, you are recommended to set the priority value to 'Below normal' or even 'Low'. Preliminary attack. The program will check the most frequently used passwords before proceeding to the next step. Literally, by selecting this option, you activate an alternative type of attack, the preliminary attack. It may take up to 1 minute on slower computers. Preliminary attack consists of several parts and allows to 'catch' short and frequently used passwords like 'qwerty' or '1234'.